We were picked up at 9 am and went straight to the Potala Palace, once the seat of the Tibetan government and the winter residence of the Dalai Lamas. The 13 storey palace is built on the highest point in Lhasa, the 130 meter high Red Hill and contains more than a thousand rooms. We were not allowed to take photos inside the palace, but got to see hundreds of impressive Buddha statues and mandalas, pilgrims offering yak butter and ceremonial scarves called khatak, the tombs of previous Dalai Lamas and the apartments of the 13th and 14th Dalai Lama. Thousands of kilos of gold were used for the tombs and some of them were over 13 meters high. 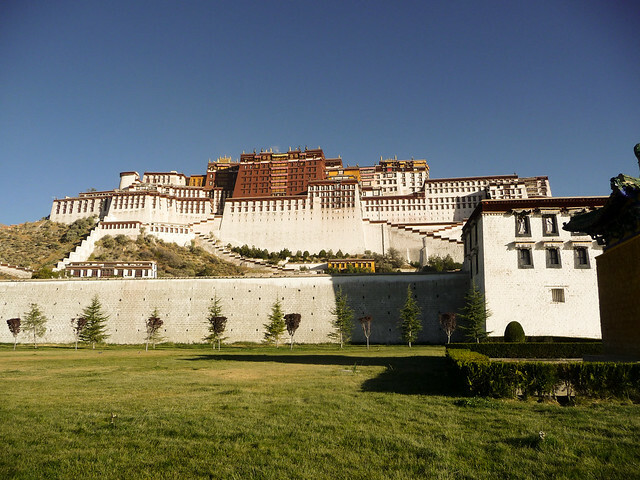 The layout of the Potala Palace includes the White Palace used for living quarters for the Dalai Lama, and the Red Palace in the middle used for religious functions. After eating Yak all day yesterday we went for a western breakfast with eggs, toast and hash browns. Yummy! We walked the pilgrim circuit (kora) clockwise around the Barkhor area and were quite fascinated by all the pilgrims in their colorful costumes from different parts of Tibet. 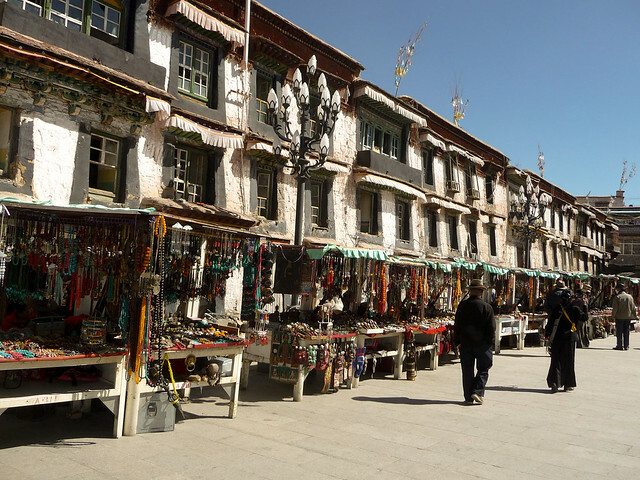 Along the route there are hundreds of stalls selling prayer flags, block prints of scriptures, jewelery, yak butter, juniper incense, Tibetian art, clothes and souvenirs. Fascinating! At 2.30 pm we were picked up to go to the Sera Monastery, the second largest Monastery in Tibet. This was, like the Drepung Monastery we visited yesterday, founded by a disciple of Tsongkhapa (in 1419). The sights were quite similar as well but the highlight of the visit was the monks debating in the garden next to the assembly hall. They debate in Tibetan, but their rituals, hand clapping and gestures makes it very interesting to watch. In the evening we went back to the restaurant in the hotel to try some of the other local dishes (our guide actually recommended this restaurant). Again the food was excellent, and the locals were playing dice games and drinking loads of beer. The waitress obviously wanted us to drink more as well and lifted the glass which means bottoms up in Tibet. Luckily the glass was small! After dinner we were invited over to another table to drink with a group of Tibetans that only knew a few words in English (happy-happy, cheers and sorry). Of course they all wanted to do the bottoms-up with us (one by one), so we were quite “happy-happy” when going to bed. When their three english words was not enough they called a friend who spoke English and she translated over the phone. Quite an interesting and fun evening!